Disha Social Organization is a civil society organisation working at field level in four districts of two states of India - Uttar Pradesh and Uttarakhand. It also works in campaign mode in 22 districts of the two States. Disha's work covers almost 6 million people spread over 600 villages in the operational area. Please click the image on the left side to download Annual Report 2016-17. Though women do major part of agricultural operations in India, they do not enjoy status of farmer. 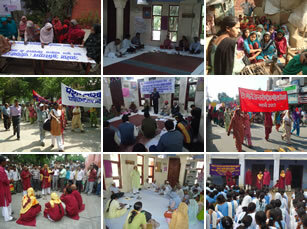 Aaroh is a campaign for asserting rights and demanding justice for women farmers in Uttar Pradesh. Disha is a regional coordinating organisation for Western Uttar Pradesh and is working with several voluntary organisations in 14 districts of the region.